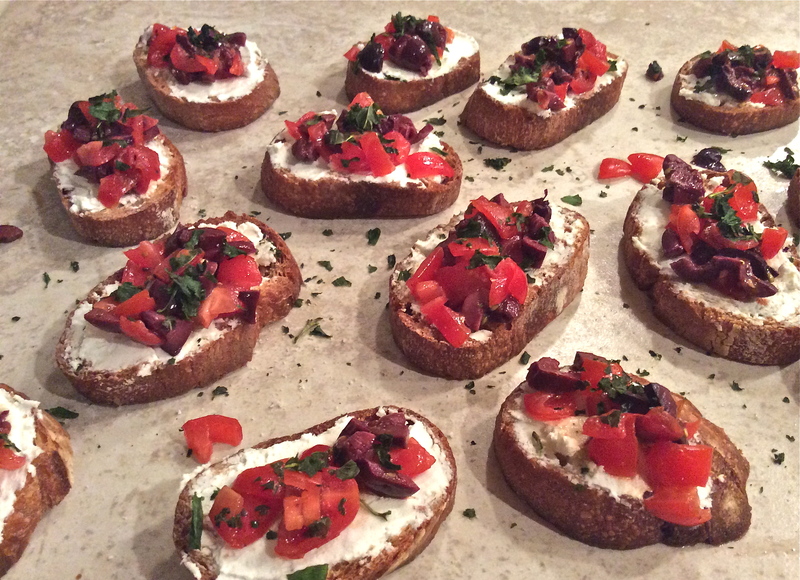 When I think of Weekend Football, hearty appetizers come to mind. To me a good-sized piece of crostini is like eating a mini sandwich. Except you get to see what you are eating and I fill up quickly on just 3 or 4 of these – okay maybe 5 or 6, cuz I like them. I have a reputation for not being able to keep anything green alive (although green happens to be my favorite color). I purchased one of those bags of fresh “living” basil that has roots and dirt attached and sits in a plastic bag. This I knew would not be difficult to keep alive so quickly brought it home and placed it in a tall glass on my kitchen window ledge. Needless to say I was pretty self-satisfied that I had a “live” plant that I could count on being around for a couple of months or so. I didn’t realize I was supposed to take it out of the plastic and water it weekly. I went to get some fresh basil this week to make pesto, and found the leaves had turned black. Imagine that! Thursday was garbage day – and the basil found itself a new home. So in making this recipe I went to buy basil leaves in one of those sleek packs of pre-picked basil, but instead found a little container of “lightly” dried basil, that you keep in the fridge once you have opened it – and it keep for about 4 weeks. My kind of gardening! Baguette cut into thin slices, on cookie sheet, with a little olive oil drizzled on top. 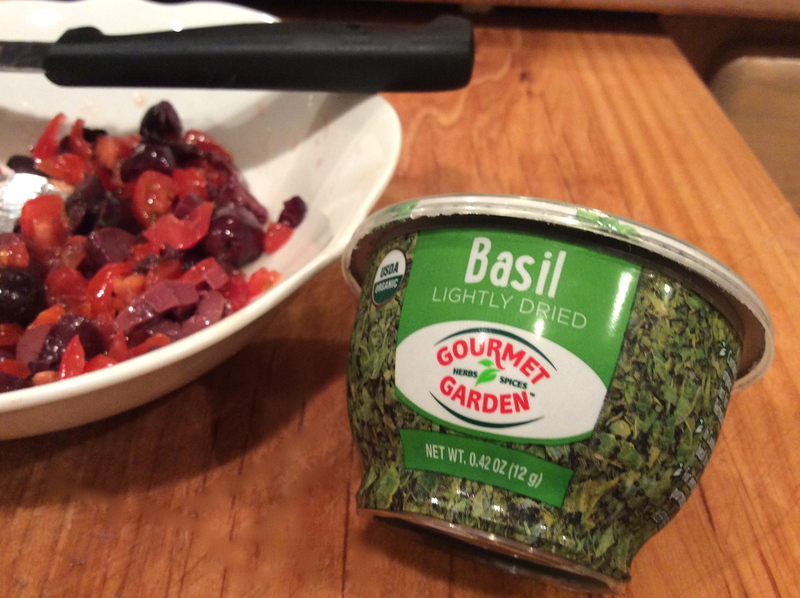 A handy-size container of “lightly” dried basil so I have it when I need it. 1. Slice baguette into 24 thin slices. 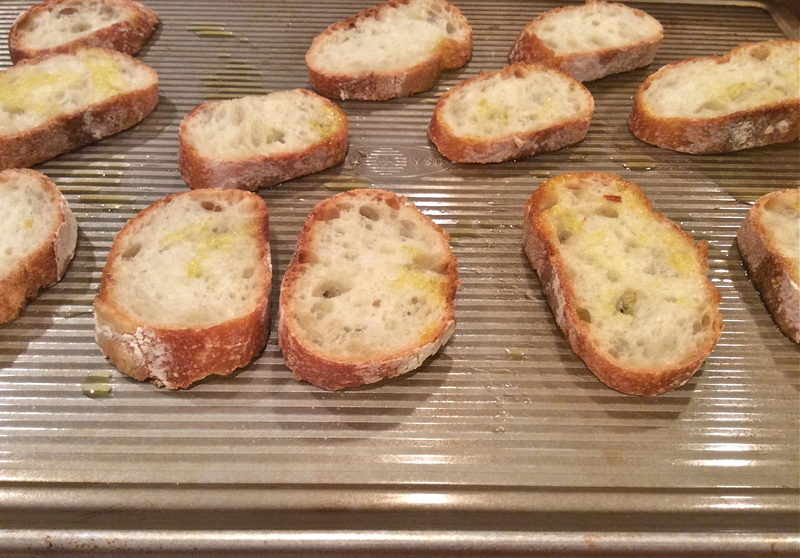 Place on cookie sheet and drizzle olive oil over the bread. Put in oven and bake for about 10 minutes till golden brown. 2. Mix softened cream cheese and goat cheese with a fork in small bowl, till creamy. 3. Remove toasts from oven and rub cut garlic clove across them. 4. Rough chop the olives and tomatoes (drain tomatoes as you chop). Add both to a bowl and pour small amount of olive oil, the Greek honey, and mix well. The honey will cut some of the brininess of the Kalamata olives. 5. Spread cheese mixture on the toasts, and top with heaping spoonful of tomato/olive mixture on top. Sprinkle chopped basil on top and teeny amount of True Lime, and serve. I think crostini was a great invention. And this version looks delicious. Add a great glass of wine and heaven it is! 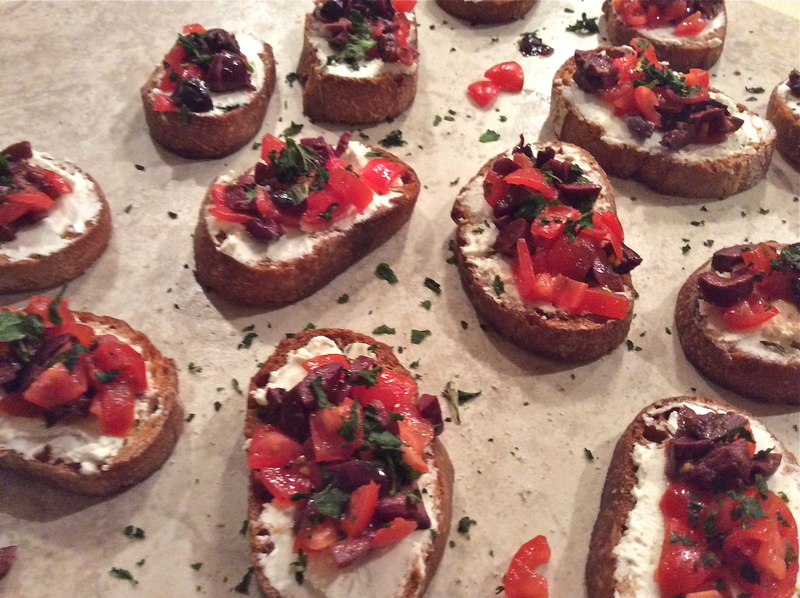 Your crostini look lovely and perfect for the weekend! Yum! Thank you. I will be serving this on Thanksgiving – as it is easy and well received.